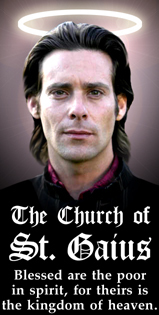 Welcome to: Son of Joxer's "Re-imagined" Battlestar Galactica Fanfic Page! and whether or not they have souls. Summary: SoJ's Favorite Scenario for "When They Find Earth"
or: How I Learned to Stop Worrying and Love the Cylons. Oh, and Lee Adama is a Cylon too. Coincidence? I think not. Because misterhook posts as SonOfJoxer at Ragnar Anchorage. Just click on Joxer's Spawn!